It’s that time of year again when your child will be returning to school. But before you head out for that infamous back-to-school shopping, it is important to make sure your child’s backpack is making the grade. Although backpacks are still the best way for your child to carry their homework and school supplies, if worn or fit incorrectly, or overloaded in weight, it could be doing more harm than good. A child’s growing muscles and joints are more susceptible to injury when heavy loads are repeatedly placed and not properly supported on their backs. A recent study, led by American Physical Therapy Association member, Shelley Goodgold PT, associate professor of Physical Therapy at Simmons College in Boston, found that 55 percent of children surveyed carried backpack loads heavier than 15 percent of their bodyweight, the maximum safe weight recommended by most experts. These heavy loads can cause harmful postures (i.e. forward lean, leaning to one side, arching the back) that could result in compression of the vertebral discs, muscle strain/sprains of the back and neck, or strain on the shoulder joints and nerves. The spinal and abdominal muscles are some of the strongest muscles of the body, and if backpacks are worn correctly, these muscle groups can work together to stabilize the spine and protect the body from injury. · Supply your child with a proper fitting backpack. The size of the backpack should fit the size of the child, NOT the amount of books/supplies the child needs to carry. The shoulder straps should fit comfortably on the shoulders and under the arms, so that the arms can move freely. The bottom of the pack should rest in the contour of the lower back, NOT sag down toward the buttocks. · Use a backpack that has a padded back and shoulder straps to reduce pressure on your child’s back/shoulders. · A waist belt helps distribute some of the load to the pelvis. · Compression straps on the sides or bottom of the backpack that, when tightened, compress the contents of the backpack and stabilize the articles. · Wear BOTH straps. Using only one strap, or a backpack with a strap that runs across the body and over only one shoulder, forces one shoulder to support the weight of the bag. Wearing both straps allows the body to support the weight of the backpack in a neutral spinal posture. · Use caution when using backpacks with wheels. If the handle does not extend far enough, your child will be forced to bend forward or twist when pulling their backpack, both actions that can cause serious back injury. Also, remember that wheeled backpacks may present problems when trying to carry them up/down stairs or onto the bus. 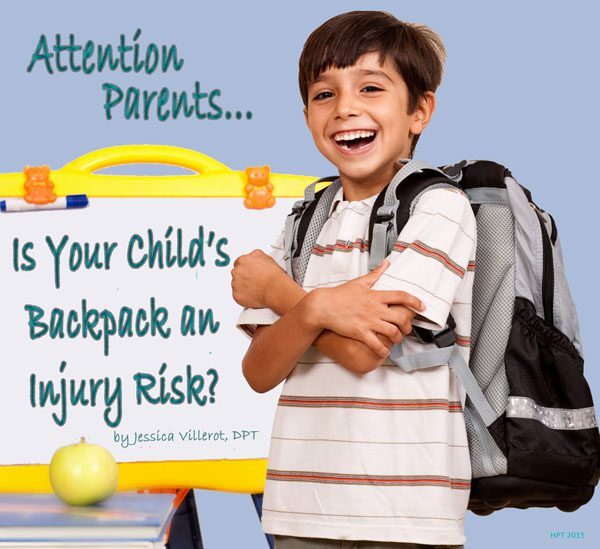 · Try to monitor how much weight your child is carrying in their backpacks. It is recommended that children not carry more than 15 percent of their bodyweight in their bags. Finally, look out for signs that your child may be negatively affected by an improper fitting/wearing backpack. · Pain when wearing or shortly after wearing the backpack. · Red marks on the shoulders. · Numbness or tingling into the arms or fingers. If your child is complaining of any of these symptoms, or if you feel your child would benefit from an evaluation of a medical professional, please don’t hesitate to call and speak with one of our Doctors of Physical Therapy at Hampton Physical Therapy with clinics in Hampton and Seabrook, NH. RESOURCES: Pediatric Physical Therapy: Fall 2002-Volume 14, Issue 3: 122-131. Backpack Use in Children. Goodgold, Shelley ScD, PT; Corcoran, Moira DPT, MSPT; Gamache, Diana MSPT; Gillis, Jennifer MSPT; Guerin, Jennifer MSPT; Coyle, Jennifer Quinn MSPT. Grimmer KA, Williams MT, Gill TK. The associations between adolescent head-on-neck posture, backpack weight, and anthropometric features. Spine. 1999; 24: 2262–2267.